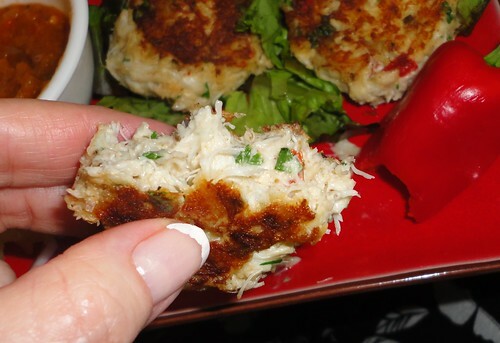 ok so i have been wanting some crab cakes!!! 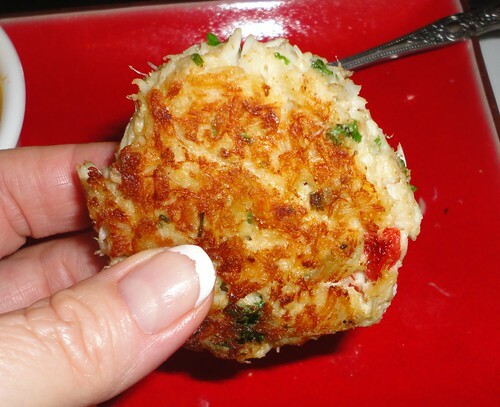 i thought i had read somewhere on the IP treads that someone made crab cakes using the potato puree...but i could not find it....so i asked several people, and they never heard of it, so i decided i must have dreamt it!!! so i thought heck, why not....try to make some anyway!!! how hard can it be right??? first off let me say i have never in my life made homemade mayonnaise! !...that is until....today!! OMG....how easy was that!!! i will never buy store bought mayo again!!! 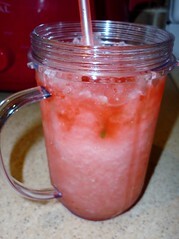 it was super easy to make using my little magic bullet!! its thick, creamy and best of all, all natural!!! here is the simple recipe!! 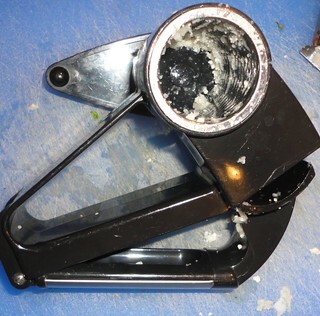 Use the flat blade blender of your Magic Bullet. 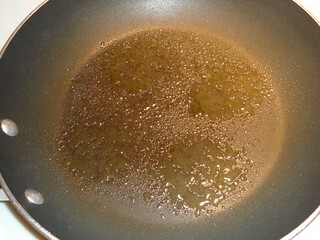 Add in the egg white, the yolk, 1 TBSP oil, the lemon juice, mustard and salt...remember to only add 1 tbsp oil at this time. Pulse quickly for 4-5 short pulses...and you will see it start to whiten and come together, then pulse for 10 secs....wait a few seconds and pulse again for 10 secs.....then add your last TBSP oil, and repeat above....pulsing for only 10 seconds at a time, until thick and creamy!!!! AMAZING!!!!!!!! you now have mayo!!! if you like sweet mayo like miracle whip you can add some stevia or splenda to taste but i did not. 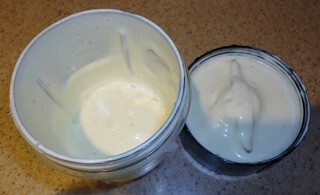 this made 6 TBSP mayo...which can keep in the fridge in an air tight container for 2 weeks. UP NEXT....time to prepare the crab cakes!!! 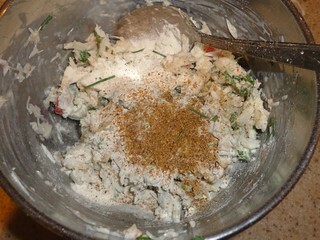 DRAIN your crab meat and dump into bowl....add your seasonings...spice it up!!! 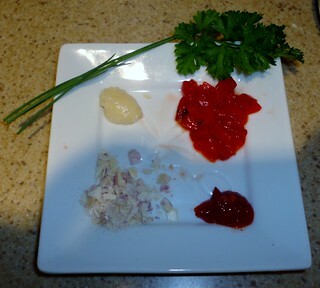 i added garlic, chili pepper, roasted red pepper, chives, parsley, shallots and pepper. then add 1 TBSP of your homemade mayo!!! 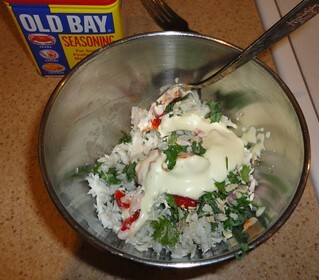 add the old bay seasoning to taste...yum....i added a lot!! 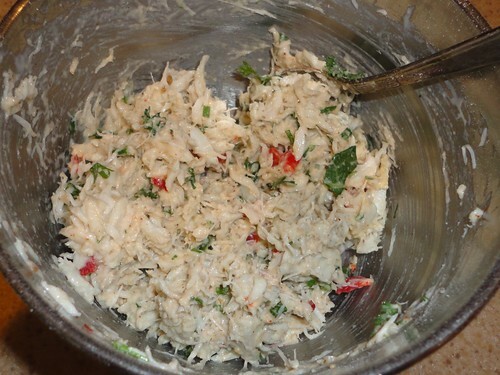 mix GENTLY...folding over carefully to keep your lumps of crab meat in nice chunks...cause its good that way, don't ya know??? 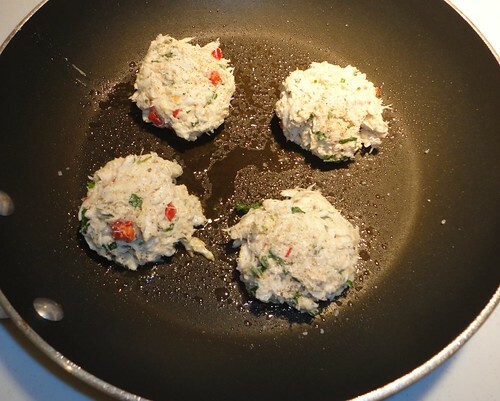 divide your mixture into 4 equal patties...don't smush 'em down now....leave 'em tall and full!! sear in the pan until browned, then turn over and sear the other side!! i used a soft bed of butter lettuce, but you can fix it any way you'd like!! 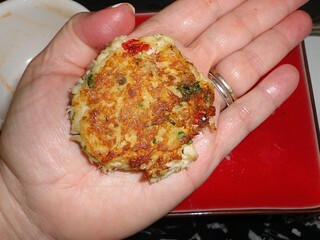 JUST LOOK AT THAT THICK YUMMMY CRAB CAKE!!! this is what it looks like inside...look at all that herb goodness!!! 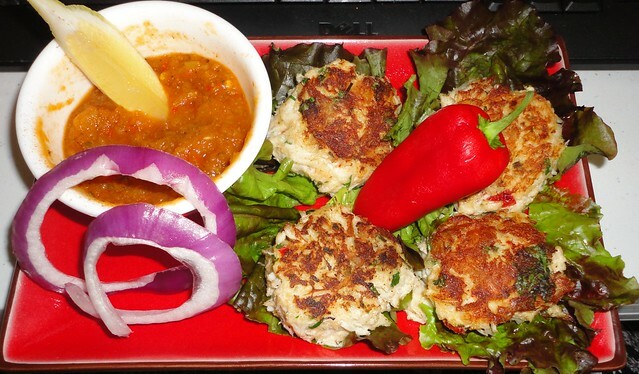 oh yeah....guess what....YOU CAN EAT ALL 4 CRAB CAKES for your serving!!! Put the straggler recipes in too! Whoo hoo! These look seriously YUM rainbow!!!! What else ya cookin up there? Keep the creations coming girl!! ok...so OMG....this was sooooooooooooooooo good!! COLORED PEPPERS & HAM SAUTE WITH SWEET COCONUT "RICE"
i know lots of IPeeps have made the cauliflower rice....however, instead of grating it...which is what i was going to do, as i was getting my box grater out of the drawer, i saw my old cheese grater....you know the kind....like they have at olive garden when they come around asking if you want cheese....with everything!! 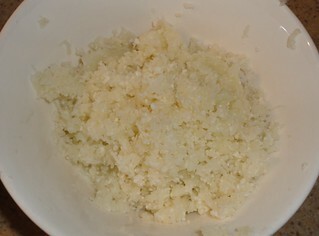 but i digress....anyway, i thought hmmmm....so i popped in a few small pieces of cauliflower and churned away...and into the bowl dropped the most perfect tiny pieces of cauliflower...very tiny almost grits size....(hmmmm cauliflower grits....another day).....it was like tiny rice!! maybe someone else already tried this...but i never knew and love how easy it was!! so i heated the pan...and used 1/2 tsp coconut oil....and added all the cauliflower and sauteed until lightly browned in a very dry pan...didn't add any other thing except salt and pepper...and OMWORD.....IT TASTED LIKE COCONUT RICE or toasted coconut vermicelli!!!!! i got so excited i forgot to take pics of the ham and peppers sauteing in the other pan!! 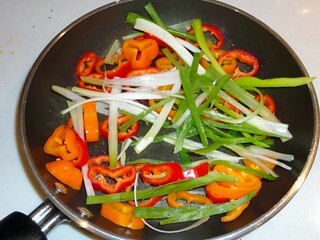 hahaha but i sauteed some red and orange mini bell peppers sliced and some green onions in a pan with 4 oz. diced ham...once lightly browned i de-glazed the pan with about 1/4 cup 0/0/0 chicken broth. in the end, i plated it on each side, but ate it mixed!! i topped it with some fresh parsley and thyme from my herb garden!! whooop whoooop!!! YUM!!!!!!!!!!!!! i love it when i make something soooo good for me that tastes sooooooo delicious!!! 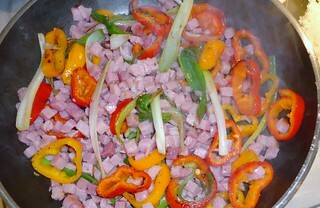 so i made it again, and took some photos of the ham and peppers and green onions in the pan!! it was just as good as before!! this is a keeper recipe!!!! ok new photos!!! this is sooooo good!!! I LOVE that IP makes me THINK OUTSIDE THE BOX...and cook in ways i never imagined doing!!! ...and THATS....WHAT WAS FOR DINNER!!! another successful day in rainbowsmiles IP test kitchen!!! using the IP crepe mix, i made a delicious tostada!!! the package made two 6 inch tostadas!!! 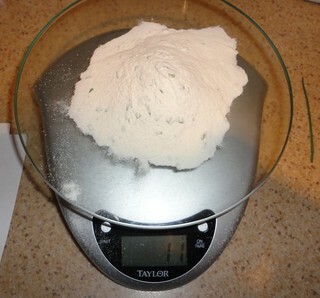 with just 1 crepe mix!! woot woot!! and OMJOLLYGOODNESS....it was gooood!!! delicious goodness piled on top!! 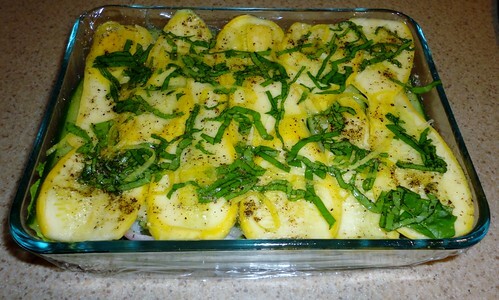 Remove from oven & spray top with pam & sprinkle with parmesan cheese. Put back in oven for a couple minutes until cheese is golden brown. 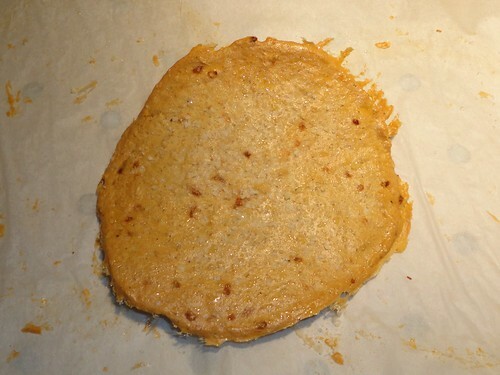 Cut in to wedges to make pita chips or use as a thin crust pizza. 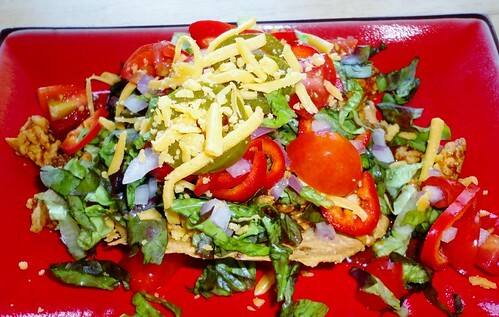 here are my tostadas!! i made 2 nice round ones!!! i made them on parchment paper...and then baked them!! this is how it came out!! all toasty and YES CRUNCHY!!!!!!!! i will have it occasionally in the place of my milk. Zucchini, Cucumber and Celery Thick Soup!! Heat zucchini, cucumber, celery, orange bell pepper, green onion, garlic and herbs in broth until soft and the liquid is reduced. 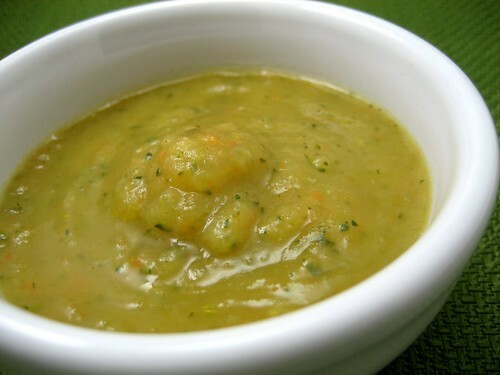 Puree veggies in batches in a blender or magic bullet until smooth. 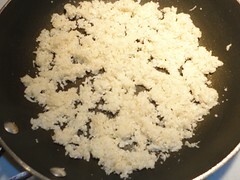 Add back to the pot and Stir in milk and salt and pepper to taste. 1 Generous serving of goodness!!! you can omit this if you want!! 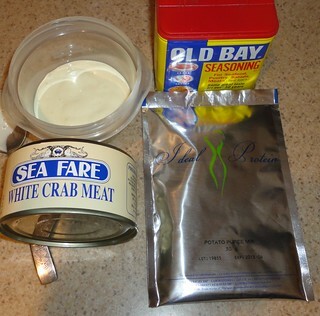 2 TBSP WF mayonnaise or 1 TBSP Homemade Mayo!!!! 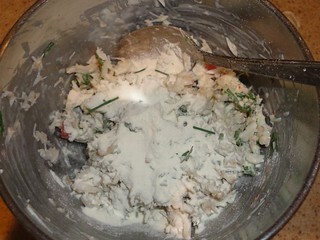 In a medium bowl, combine yogurt, mayonnaise, lime juice, curry powder and salt. 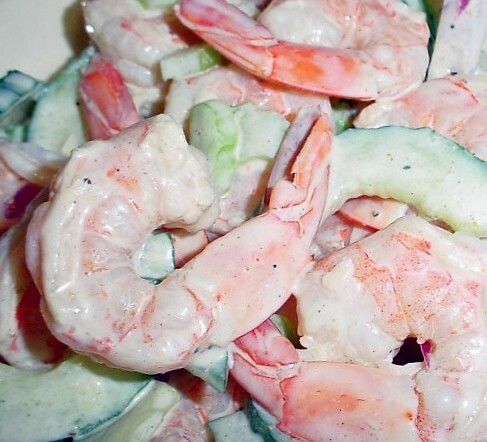 Add shrimp, celery, cucumbers and mix. Refrigerate until ready to serve. Have you tried the recipe without parmesan cheese? I'm in phase 1 and don't think I can have cheese. Just wondering if it would still turn out good...it does look very good! Southern Shrimp and "Grits" & Raspberry Ginger Mint Julep!!!! Oh My!! ya just gotta love being able to take a favorite meal...and make it IP legal!!!!!! thats what was for dinner!!!!!!!!!!! and its nice and refreshing!!! quick and easy. 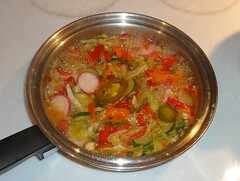 simmer veggies in a pan with 1 cup low sodium no fat chicken broth...this is a GREAT way to use up bits of leftover veggies...i used some shredded cabbage, 1 green onion, a piece of zucchini, some mini bell peppers, a few cauliflower florets, some roasted red pepper, 1 celery stalk, a few radishes, and some jalapenos and red pepper flakes cause i like it spicy!!! just about any veggie will work!! 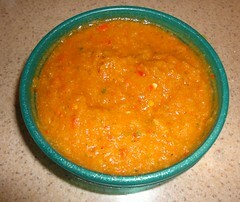 after cooled, puree the veggies in a blender and add more seasonings of your choice...like a dash of hot sauce and more creole seasoning!!! use a little reserved veggie broth as needed to make it a medium thick sauce. omg i can just eat this whole bowl just like this!!!!!!! so good!!! 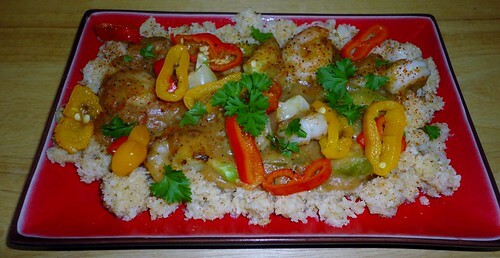 set aside and prepare cauli-"grits"
then pour in your veggie sauce!!! oooh my!!! 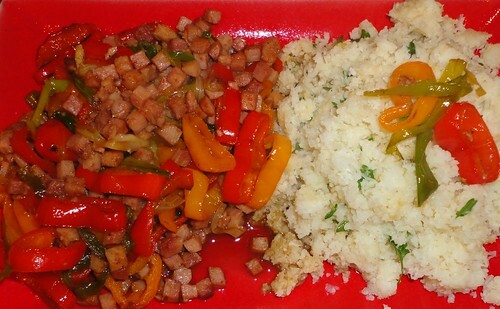 plate your cauli-grits....top with shrimp and sauce and garnish with sliced colored peppers, parsley and a dash hot sauce!!!!!!!! ooooooooo weeeeeeee and as Justin Wilson used to say....you gawnna lik dis, " I gar-un-tee!" i made a smaller version, used basil instead of dill and added fresh lemon zest!!! HOW DIVINE!!! i also only used half the amount of oil!! 1. 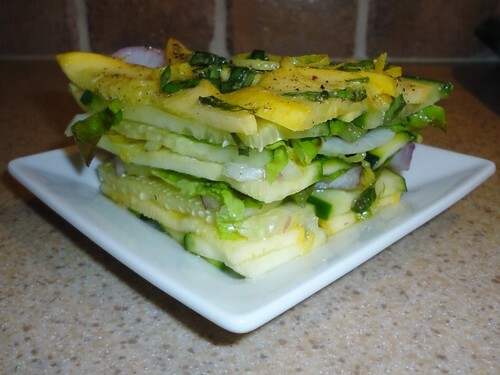 With a vegetable peeler or mandolin shave zucchini in thin strips. 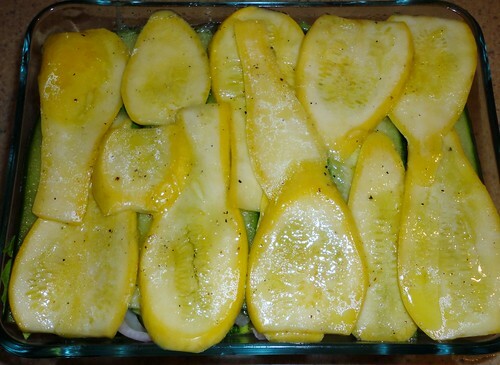 Salt lightly, then transfer to colander to drain, about 15 minutes. 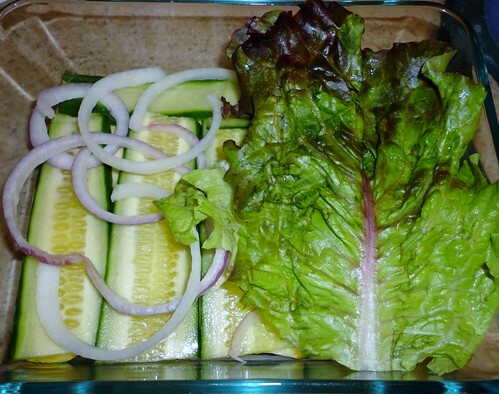 Meanwhile, shave cucumbers in strips and thinly slice onion. 2. 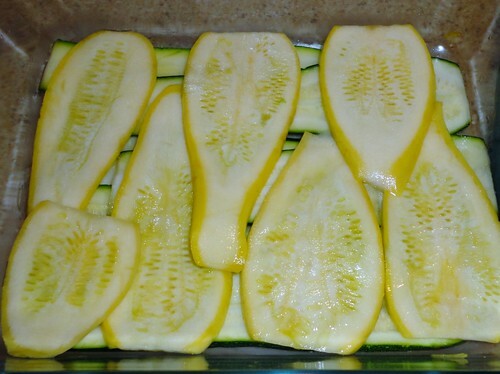 Rinse zucchini and drain in colander. 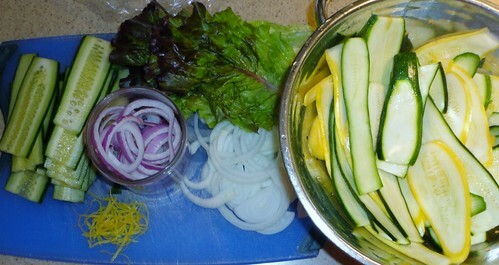 To assemble salad, in a 2-quart square dish layer one-third each of zucchini, lettuce cucumbers, and onion. For dressing, in a glass measuring cup whisk together lemon juice and oil. Drizzle some of the dressing on layered vegetables. Repeat layering and dressing twice. 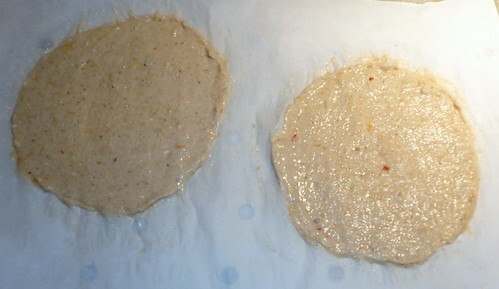 Cover and refrigerate 1 hour or up to 12 hours before serving. 3. 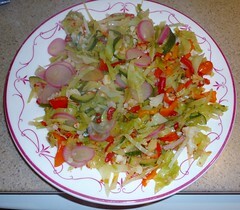 To serve, sprinkle salad with fresh dill and pepper. 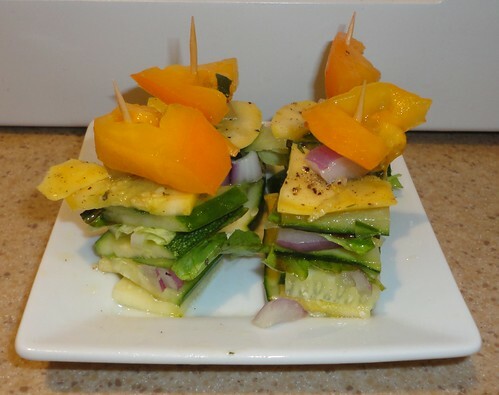 Cut salad in rectangles with a sharp knife; lift out with a spatula. i finished off the top layer and drizzled the dressing over all. 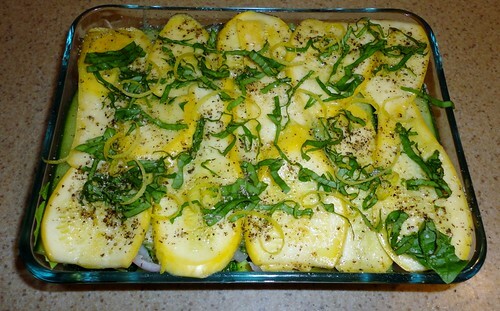 then i added a chiffonade of fresh basil from my herb garden and fresh lemon zest!!! YUM!!!! smells so gooood!! i covered it in plastic wrap, pressing down to seal it well and to compress all the veggies and put into the fridge for several hours!! **** it is even better the next day, and is still delish 4 days later!!! Each time i had some I would drain off any liquid that had gathered in the bottom and I think this kept it fresher longer and kept the veggies all crisp!! Once I decided to stick in some toothpicks and have mini veggie stackers...i topped them with a tiny piece of orange tomato!! i called them....SUMMER SNACKER STACKERS!!! 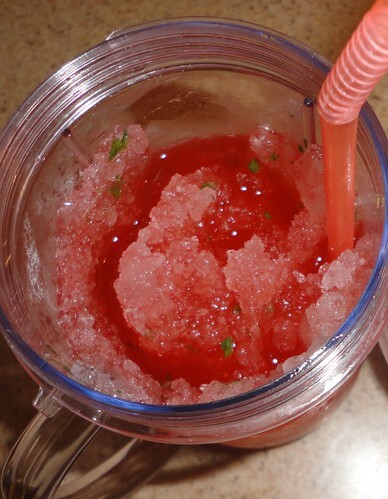 this is a great refreshing recipe that i know i will make again and again!! 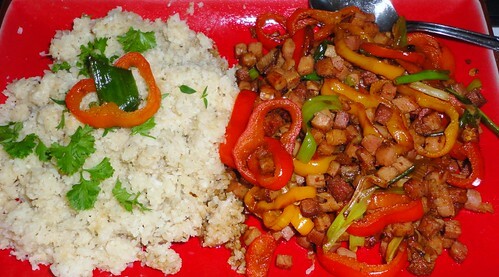 you can always change up the veggies too....yumm....red and green and yellow bell pepper layers???? Oh my! I cannot wait to try some of these!